Digger often fertilizes bamboo plants. 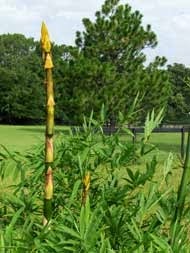 I don't know about you, but growing bamboo in our area (North Central Florida) is challenging. Come to think of it, growing anything here is a challenge. Florida has 4 distinct growing zones: North Florida, Central Florida, South Florida, and Tropical Florida. As luck would have it, we're at the bottom of North Florida, and at the top of Central Florida. What does this mean? To you, absolutely nothing. To us, it means we get more freezes than Central Florida, more heat than North Florida. We get them early and late, coming and going. No wonder ol' Bill doesn't know if he's.....well, you know. Although winter's tend to be mild here, for the last 2 years, that has not been the case. Oh.... no, no, no. We've had temps down into the low teens both years, and for several days at a time, and for several instances. So, guess what's been happening to our bamboo? You guessed it. They grow and grow during the summer, then winter comes and, BAM!, the freeze kills back all the lovely canes that were so promising. Even the established bamboo gardens at Kanapaha Botanical Gardens suffered major losses. Bamboo's that have been standing for years were lost. And the property were we dug up some of our bamboo sprouts lost the big clumper. 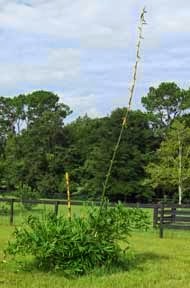 But, our bamboo plants themselves survived and there are things we can to get some canes established this year. Pray for a milder winter and fertilize really, really well. Piled on the composted horse manure behind the barn. Added worm castings to that. Two week later, we add VermaMax® (composted chicken doo). This particular species of bamboo is meant for Zone 9. We are Zone 8. I'm afraid, very afraid. 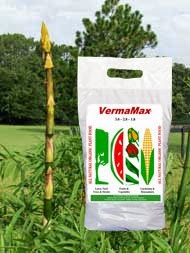 Find information about VermaMax® at Monroe Works. Pure Black Castings™: Certified organic worm castings (poop). VermaPlex®: Liquid microbial soil inoculant (a real mouth full) made from the above. VermaMax:® Organic chicken litter (again, poop) composted with the above.